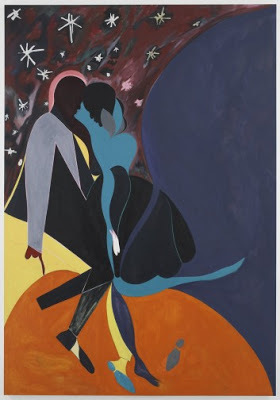 Chris Ofili, “Lover’s rock – guilt,” 2007, oil on linen, 110 5/8 x 76 7/8.” Image courtesy David Zwirner. In the Guardian, Charlotte Higgins blogs that she isn’t sure what to think about Chris Ofili’s show at the Tate. “I’d seen some of Chris Ofili’s new work in the lavish new Rizzoli book he has helped put together. Even so, after walking past so many greatest hits and old friends in the galleries at London’s Tate Britain, where his latest career survey opens to the public tomorrow, I got a jolt when I walked into the final pair of rooms, filled with his most recent work. 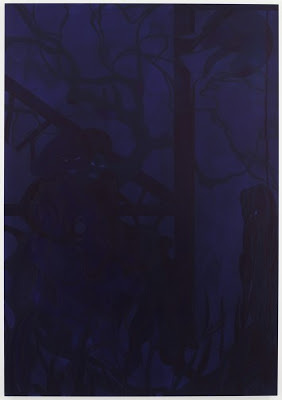 In the first, the paintings are entirely blue – deep, midnight shades of indigo, ultramarine and bilberry. In the second, the paintings are screaming with acid colours: strident purple next to citrus orange; a tintinnabulating turquoise; egg-yolk yellow. And there is no elephant dung. And no glitter. 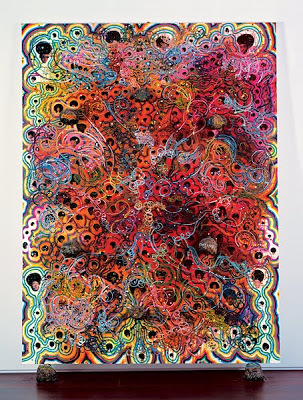 “Chris Ofili,” curated by Judith Nesbitt. Tate Britain, London. Through May 16, 2010.
wow !1 can you believe i just found your blog today ? it is great . i loved this ! . there is anyway to follow this blog ? i've tried to find a link or something , but nothing . Thanks. You can add Two Coats of Paint to your blog reader by clicking on the subscription button in the column at right. In my book, Ofili's more than earned the right to follow his paintings where they lead, without worrying about what people–or critics [yes, I know they're people, too]–think an Ofili 'should' look like. Also, the flatness and reductionism/abstraction of those [more] recent works remind me of giant Jacob Lawrences. Others kind of veer toward Chagall, of all things.